Spider-Man Deadpool #1.MU is a Monsters Unleashed tie-in. Marvel launched the new franchise with Monsters Unleashed #1 this week. We are expecting major developments as other super hero characters from the X-Men, Avengers, Inhumans and every corner of the Marvel comic universe comes up against a new threat. Strange leviathon monsters from an unknown world are causing havoc on earth. Spider-Man and Deadpool come face to face with their own monster problem. To make these circumstances worse than they already are Spider-Man has Deadpool on his side. Spider-Man as ever the hero takes it upon himself to defend New York city’s inhabitants from the monsters. This title sounds like a fun, entertaining episode which fans of Spider-Man and Deadpool will both appreciate. 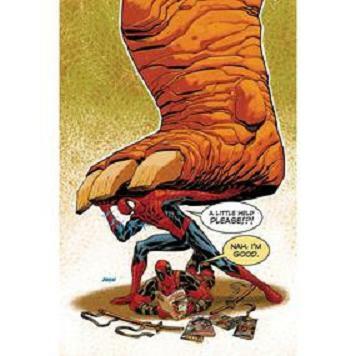 Team ups with the two characters always produce memorable comics, as seen with the presenting running title Spider-Man/ Deadpool (mainly from Kelly & McGuiness). Writer Joshua Corin (Nuclear Winter Wonderland) and artist Tigh Walker (The Beauty, Big Thunder) are the creative engines maneuvering this episode into place. Spider-man Deadpool #1.MU will be in comic book stores from January 25th.